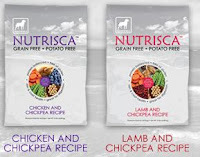 Dogswell has a new line of dry dog food called NUTRISCA which is free of high glycemic potatoes, sweet potatoes and tapioca. 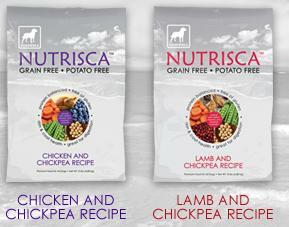 Instead, potatoes are replaced with low glycemic, highly nutritious and palatable chickpeas and peas. These low glycemic ingredients provide better digestibility for sustained energy, and chickpeas and peas are both excellent sources of protein. They also are environmentally friendly "pulse crops" which use less fossil fuel and emit less CO2 thereby reducing greenhouse gasses. 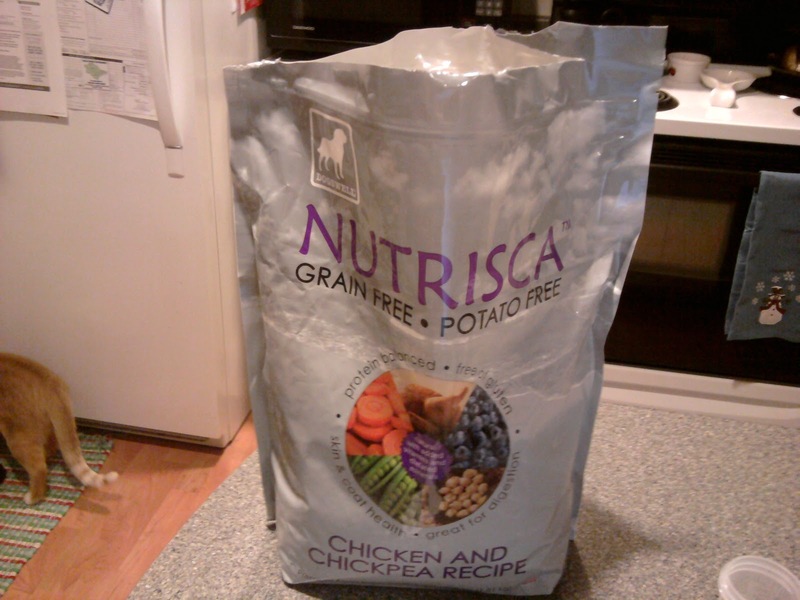 I received a 4 pound bag of NUTRISCA Chicken and Chickpea recipe for my dog Dotty to try. 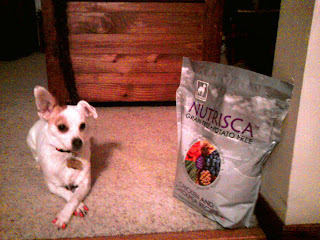 She absolutely loved this NUTRISCA formula and seemed to enjoy it better than the "big brand" of dog food I had previously been feeding her. 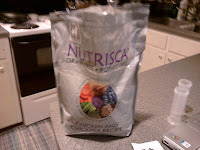 So I was not surprised to find out that NUTRISCA has been preferred 3 to 1 in taste tests. Not only that, but this dog food was the perfect size for her and good for her as well. It contains meat as the first ingredient and is certified low glycemic to keep her weight healthy. It also contains antioxidant-rich super-fruits which boost the immune system along with salmon oil which helps the coat and eyes shine with Omega 3 and DHA. After going back to her old brand now that we ran out of NUTRISCA, I have noticed that she's gained weight and is less active as she was when she was eating NUTRISCA. What I like most about NUTRISCA, aside from the fact that my dog loves it, is that it never contains any gluten, soy, corn, wheat, flour, added steroids, hormones, artificial colors, flavors or preservatives. It's hard to find a dog food without those added preservatives these days, so it's good to know there's a healthy option out there. Win It: Enter here to win a 1 lb. bag of NUTRISCA dog food! 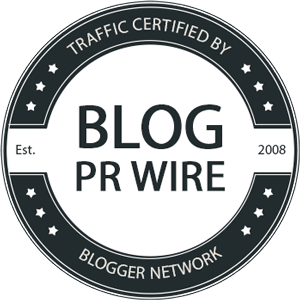 Mandatory Entry: Tell me something about your dog in a comment on this blog post! Contest Details: Giveaway will end on Friday, February 18. 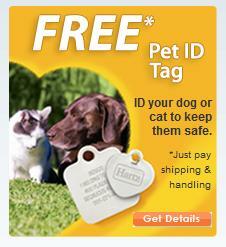 Continental US residents only. Winner will be drawn via random number generator. Winner will be contacted by email and will have 48 hours to reply before a new winner is chosen. My dog, Homer, can be a little picky with the way he eats sometimes, but I'd love to give Nutrisca a try because it's never a bad idea to get him eating a bit healthier. mocha is the best dao ever. Just like a human. My husband and his dog:just like a boy and his dog. We have had her 9 years now. She is truly part of the family. I look forward to having Mocha try this healthy food. My dogs Kouga and Milele are such good companions and keep me company when my husband works late. They also keep me warm during these cold days. I like CheapSkate4Life on Facebook.